It as been a week of big whiskies for me so it is not surprising I am writing again about another cask strength whisky. You all know about the vatted malt from Douglas Laign, Big Peat whisky? I hope so. Well once a year the vatting masters deliver the Christmas Big Peat 2014 cask strength bottling. Yet to be released into Australia I was fortunate enough to be sent a 50ml sample (after some comments online about why we were not getting it) by the lads at Douglas Laign to try. If you want to know more about the standard release of Big Peat check my other post on the subject: Genie In A Bottle - Big Peat. 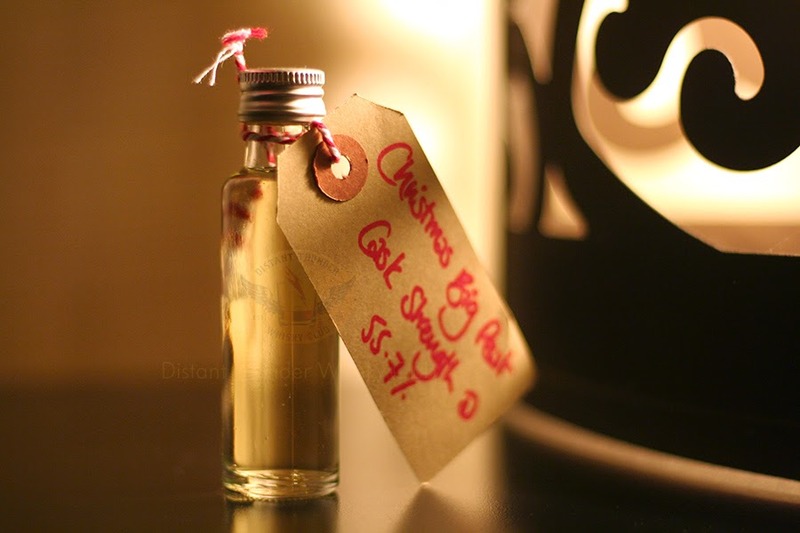 Christmas Big Peat is the same whisky as its standard release's cousin just at a smacking cask strength punch. The vatting as usual features 4 great Islay single malts in one bottle: Ardbeg; Bowmore; Coal Ila; Port Ellen. Colour: blonde wheat and I swear it is even lighter in colour than the standard release I currently have. Nose: Amplified phenolic oils and salts as it almost sticks to the nose. Seaweed with ashy peat smoke all in the forefront laced with rich creamy toffees lingering in the shallows. For a cask strength there is no burn in the nose at all. After the first sip sandal wood and oiled leather appear. Taste: Lip puckering as a spicy prickle immediately takes hold. Oily and tongue coating but at the same time delivering an earthy tannin dryness of carbons or coals in the checks to upper palate. Creamy vanillas are still present from the nose but the spice sticks hard and on a second sip the creamy sweet notes are more emphasised. It is a very feisty dram indeed. Finish: Smouldering coals delivering a long warming sensation to the chest. Spice prickle does perpetuate on the lips as does the dryness that slowly envelopes the entire mouth cavity. Overall: The nose is super excitable and I could go on nosing all night long. A real highlight. There is a strange balance between the sweetness and phenols but the spice is very high. The eventual tannin dryness that builds makes for a higher that normal salivation that just emphasises the ash content over and over. The high spice may put some off as it is no where near as present in the standard Big Peat release but then that is why you buy something like this anyway. If I was to give a dram it would be a solid 6 out of 7. A good bit of fun and only being able to get it once a year makes it a trip worth taking. To add some texture and quench that salivation, I found myself drawn to cutting some sharp vintage cheddar cheese (one with a good amount of crunchy tyrosine is recommended) which went exceptionally well with the whisky. As I drammed and dreamed my imagination settled on thinking about an old style whalers oilskin jacket lashed with salts and barnacles chopped up by galing sea spray. So if your in the market for a purchase just look out for the label. The packaging is significantly different from the regular release that you are not going to make any mistake what you are buying. 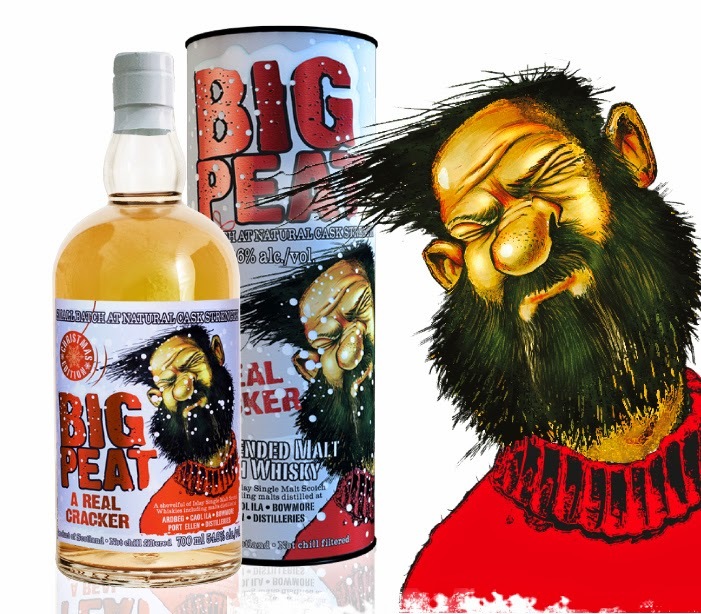 Keep an eye out for a white label sporting the byline ‘A Real Cracker’ with the Big Peat character taking a salty phenolic smack across the chops. You won’t be disappointed if you a Big Peat freak like myself.but be prepared for an even bigger hit than usual. Thank you Douglas Laing and Big Peat for you sample. It was very much appreciated though it won't hold me over until hopefully a release into Australia in 2015.